Backflip - How is it at the moment. Forums › Slingshot and CallPlus › Backflip - How is it at the moment. The wife just upgraded from iPhoto to Aperture so Mozy wants to re-upload the 130GB worth of photos in her library. How is it behaving for everyone? There were a few issues when it came out. Has anyone tried the Mac client out? Ok so I've downloaded the Mac client. It's hideous. None of the UI fits. It has your user sub folders and "advanced' opens up the entire root requiring you to drill down through the Unix folder structures. Not something I'd suggest for a relative whose PC I'd have to support. But hopefully does the trick for us and saves some $$. Yeah Backflip isn't the sharpest tool in the shed. is it like a new plan? Forum posts go unapproved, CS requests go unanswered. Backing up seems to be quite slow in the software, which is crap. for something supposed to backup in the background it was whoring massive of ram, disk access was substantially slowed down with it running, and it was only pushing up about 100kB/sec so there is no excuse for that. When I had it selected to back up my music drive (1.8TB) it would be about 6 hours before it even started to upload from when I pushed the button, and all that time the PC was unusable. Hamish Backflip.co.nz is an online backup system. $5 NZD a month of unlimited storage and zero rated data on Slingshot. So it sounds fantastic. But appears to be a bit.... Rubbish compared to other solutions out there (eg Mozy). 100KB/s is close to what ADSL is capable of. 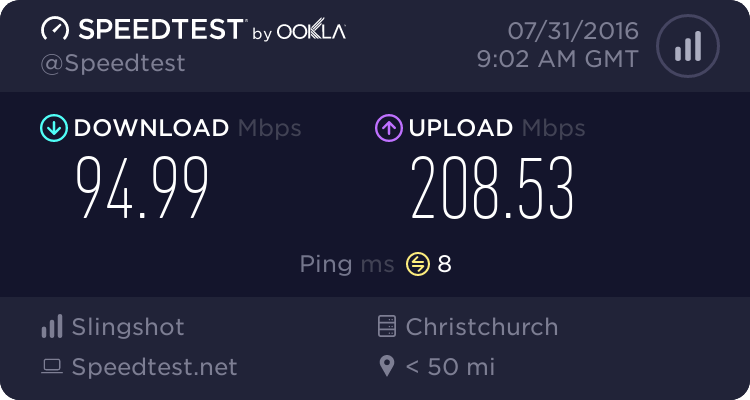 I'm getting about 600Kb/s at the moment which is at 8pm is definitely on peak. It was 900Kb/s earlier (75KB/s and 112.5KB/s respectively). Their forums look to have been ignored since November. And we're customer 157 if the numbers are sequential... Not a good sign?